This is the second CD – the first was Words of the Angel – from three young Scandinavian singers. (Anna Maria Friman is Swedish, and Linn Andrea Fuglseth and Torunn Østres Ossum are Norwegian.) Eschewing any kind of instrumental accompaniment or electronic trickery, the music and the performances on these CDs are as unadorned as the robe of a penitent monk. Even so, the spirituality that they exude is as brilliant as the light refracted through a matchless diamond. Maybe the imagery of a monk's robe is misleading, however. One might do better to use the word "naked" (as in "pure") to describe the work of Trio Mediaeval. As its name suggests, the Trio specializes in music from the 15th century. Leonel Power's dates are c. 1330-1475, and his Missa "Alma Redemptoris Mater" is based on a plainchant that is even older. (It is performed at the close of the CD.) Unfortunately, the four movements of the 22-minute Missa have been interspersed with other works on this CD – a decision which obviously interferes with the cumulative impact of the Missa. Also, the Missa almost certainly would not have been sung by women. I mention this not to be churlish, but simply to alert potential listeners that the point of Soir, dit-elle is not historical authenticity. The "other works" are modern; the earliest one (1999) is Ivan Moody's The Troparion of Kassiani. All were written for the Trio Mediaeval. At first glance, this sounds like a stylistic fender-bender in the making, but Moody, Gavin Bryars, Andrew Smith, and Oleh Harkavyy have written brief works – none longer than ten minutes – that, like teenagers in a sports bar, don't readily give up the secret that they are younger than they might seem. The transition between Power's Missa and the modern works is not seamless, but it is smooth, and many listeners will not be aware of how centuries come and ago during the course of this CD. John Potter, formerly of the Hilliard Ensemble, is Trio Medieval's mentor. He is also this recording's producer. In his booklet note, he alludes to "a timeless present" in which distinctions between 15th- and 21st-century polyphony blur and disappear. The disc's layout – and the absence of translated texts, which Potter peevishly defends on ECM's website – makes it easy to lump Soir, dit-elle in with the mass of "spiritual" New Age discs, which it most definitely is not. 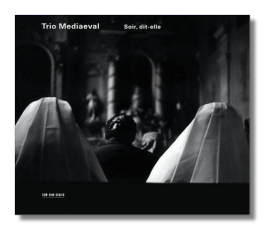 The three women of Trio Mediaeval tune, blend, and shape their voices with almost intimidating precision, and neither the music nor the performances will give much back to the casual listener except a vague sense of the ethereal and of having been gently rinsed clean. More is required of the listener, and much more is returned. The recording venue was a church or a chapel, and the extremely "live" acoustic warms up the performances in a very appropriate way.